President Trump today announced in no uncertain terms that he will hold federal agencies responsible for their own cyber security posture. In a meeting with cyber experts, Trump expressed his commitment to secure the nation’s infrastructure. What does this mean for government contractors? Trump’s commitment to IT modernization, specifically cyber security enhancements, will undoubtedly translate into opportunities for contractors. Agencies that have been hesitant to spend large sums on cyber enhancements may now have the motivation they need to pony up the cyber defense dollars. It stands to reason that those at the top will be motivated to spend more to keep themselves away from potential Presidential fury. Contractors that want to position themselves to take advantage of these opportunities should start by ensuring they won’t be disqualified from Dept. of Defense contracts. Starting December 31, 2017, the DoD will require all contractors to be compliant with NIST 800-171. 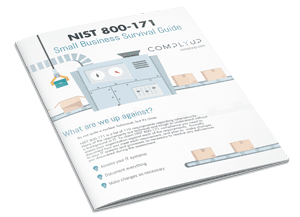 The list of 110 NIST 800-171 requirements focus on confidentiality of Controlled Unclassified Information (CUI).